This morning Natalie spent over 20 minutes busying herself in my purse. She pulled out my lipstick, compact, keys, and various accessories. Most interesting of all was my wallet. 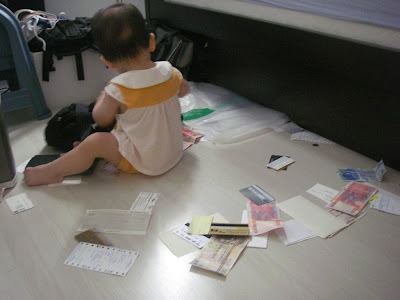 She spent another 10 minutes on my wallet, pulling out my credit cards, money, and receipts. See Video 128 of Natalie emptying out my wallet. 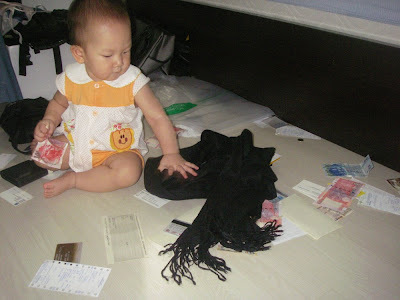 She hands me most of the money (good girl!) and when she tries to give something to me and I say "no thank you", she tosses it aside (smart girl!). 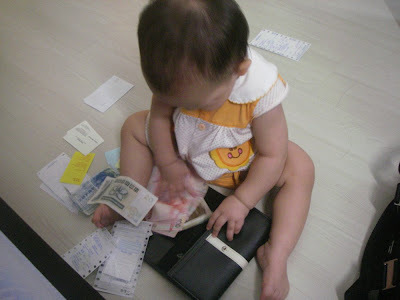 Also see Video 129 of Natalie playing with my wallet from a different angle. In this video, you can see how coordinated her fingers are now. 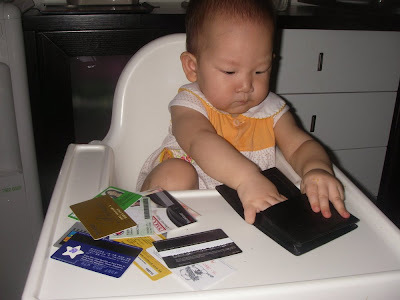 Also, she understand that things have two (or more) sides and will flip the credit cards around to see both sides. Natalie making a mess of my purse and wallet this morning. This is just the beginning. My pashmina. She crumples it and uses it to mop the floor (maht day). She's learned to do this by watching our helper, Suparti, use a cloth to wipe clean her play mats. I'm trying to feed Natalie breakfast. To keep her occupied through the meal, I've given her my card wallet. She makes short work of emptying that, too.